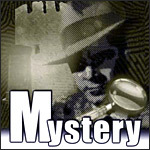 Brad Runyon, the stout-but-stalwart investigator, is one of Dashiell Hammett’s classic characters. Charismatic and captivating, Runyon had a way with the ladies in spite of his 237 pounds. Backed up by his secretary Lila North and his close friend Cathy Evans, he took on some of the toughest cases the Big Apple had ever seen. Listeners followed Runyon through the streets of New York, to places like Grand Central Terminal and Greenwich Village, as he sought to bring criminals to justice.